MY Christmas tree is finally up and lit ! Putting up the tree was a breeze but decorating was not. I had under-estimated it and ended up with many small ornaments which once up, seemed lost in the dense branches. So I went to Petaling Street to shop for decors. You would think things were cheap there as compared to Metrojaya or Jusco, but really, I was in for a surprise. They weren't cheap alright. Very simple, stylized styrofoam baubles went for RM20 at its cheapest for half a dozen (or less) and I needed at least 20 of the large ones for my pine forest. Since I was already there, I store-hopped and bought only those on sale. They were shiny and nice like the newer ones, and I strictly didn't want to splurge on the decors. I also added some nice wired ribbons on reels to my purchase. And then, the fairy lights ! For that, I went back to the Bangsar Shopping Centre where I had bought the tree two days earlier. The lights in Petaling Jaya street cost RM19 to RM30, while the same lights in BSC was like less than RM7 for 8meters of 100 bulbs. I needed 500 bulbs for radiant brightness. Thanks to Mek Zin who gave me some tips on tree management, I was able to come up with a decent looking tree in two challenging hours. Fixing the lights were not fun but once that was done, it was easy for everything else to fall into place although I could do with more trimmings. Maybe I could make some. Your tree's actually so awesome Jaya, I honestly love it! 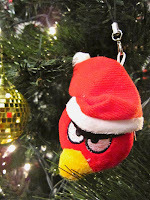 Great post as always, you're sure going to have an awesome Christmas! A small tree indeed, that one is almost an Ent!! Your decorating labours should not be long lived if you have kids, who will overrule and overrun you in all decisions thereof. Happy Christmas to you, and your family. Yes, Jaya, your tree looks spectacular. What fun! Shouldn't there be a fairy at the top and a few gifts at the bottom? It looks absolutely beautiful - you’ve done a marvelous job! That tree looks fabulous! I love it. Particularly fond of the wired ribbon! 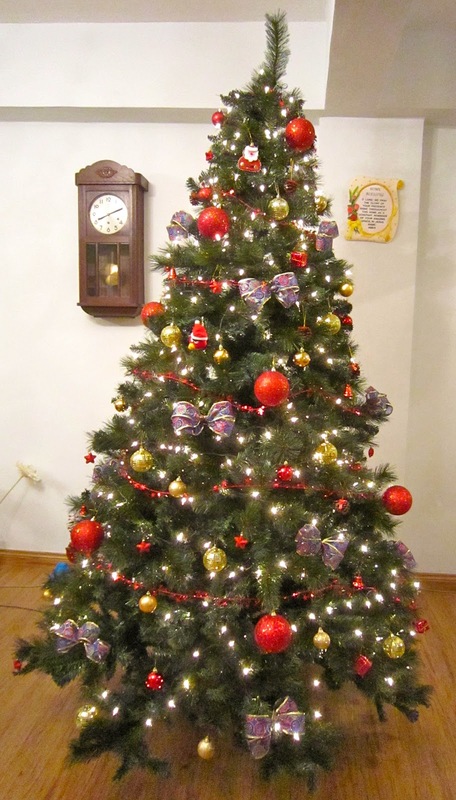 AhhH, you're first tree in your home; glad you went BIG! It's really such a gorgeous tree. Kudos! That three looks amazing! I'm jealous... I have some xmas lights in my living room and a two foot fiber optic tree I haven't taken out of the box. I've known many that could never stick to their "only going to get a short tree" promise. haha. 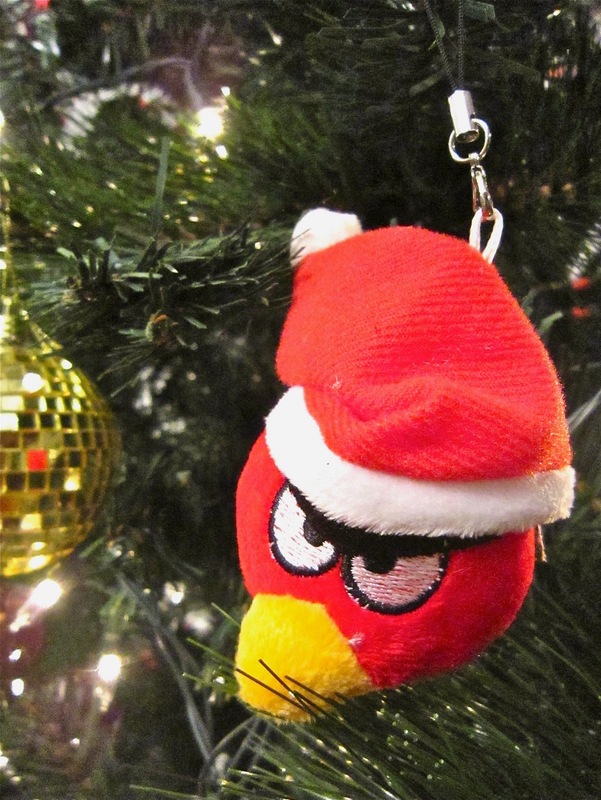 BTW...love the angry bird ornament. That is a beautiful tree! Good for you - it looks lovely. I have my tree up, and the lights on, but my son and I have yet to decorate it. Tomorrow, for sure. You truly went all out, not a short tree at all..haha..great decorating job too. Looks great. We got ours up and decorated last night. My 3 year old and I made the decorations this year for the tree. OILS and I go a long way. My mom used a lot of oil on me, growing up. As a teenager, baby oil was my go-to daily face moisturiser. I didn't know then what I know now about synthetic oils but it worked for me. In my early 20s, I fell in love with pure essential oils. I was introduced to the world of Culpeper during work. Then, I was gifted a 50ml bottle of jojoba base oil with two precious bottles of 10ml rose and geranium essentials oils courtesy of Culpeper. I was set for life and I've never looked back ever since. Do You Feel The Same? I noticed that I'm only propelled to write when I'm unhappy, sad or desolate - basically whenever my heart is burdened by some of what life has thrown at me. That's one of the main reasons why I haven't been writing on here often in the recent years. I want to be remembered as this fresh-spirited, witty and uncomplicated narrator. But it's so hard to write about the jolly things in life when my mind is tangled up so much in a web of worries. I don't want sappy tales of my life floating about in the world wide web long after I'm gone. And yet, I find myself most comfortable indulging in unhappiness. Or rather it's easier to relate to conflicts, physical pain and loss than to all the other things that I should be happy about. Does that make any sense to you? Or is this mid-life crisis? I felt it in the air on the morning of May 10, 2018, I swear. The air felt fresher, the sky looked calmer, trees greener, and people, nicer. It was like a spell had been broken, and the evil forces, banished and put in their places, and good prevailed. I could breathe better. I sensed the jubilation in the quiet, morning atmosphere. The heaviness I felt in my heart the night before had vanished. Never did I imagine that I would live to experience that day and moment in history in my lifetime. And, so did every Malaysian who were on their knees and toes, doing all they could for this change of government to happen through the 14th general election on May 9. Truth to be told, I never doubted for a second that the opposition could take over. But...it's the but that bothered us too much because electoral fraud was a threat greater than your mother-in-law during the period.